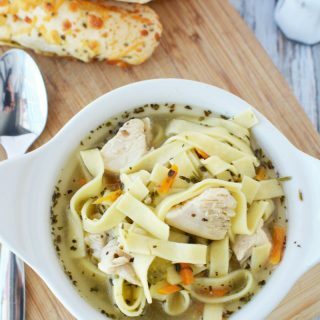 Homemade chicken noodle soup right in your Instant Pot! Use fresh pasta and chicken to create a perfectly soothing and delicious home cooked meal that will have you curling up on your couch. Place oil, chicken, garlic and onion into the instant pot. Sautee the chicken until brown on all sides and onions are translucent. Season with salt and pepper. Add carrots, celery and spices to instant pot. Add chicken broth and stir well. Close instant pot and close the quick release valve. Set instant pot to manual, high pressure for 5 minutes. Once cooking cycle is complete, naturally release pressure for 3 minutes. Then open the quick release valve to release the additional steam. Open pot and stir in pasta. Let set five minutes, stirring occasionally.